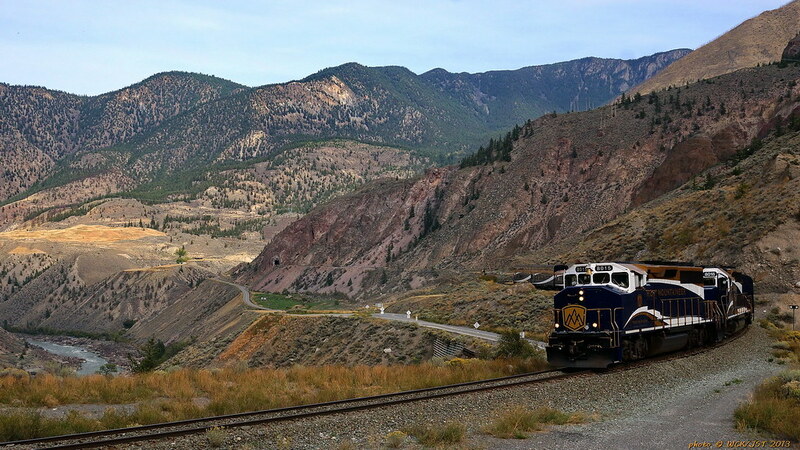 Here are six photos of the 'Cariboo' Rocky Mountaineer south (west) bound on the ex-BCR route in the Clinton - Lillooet area of the BC interior. 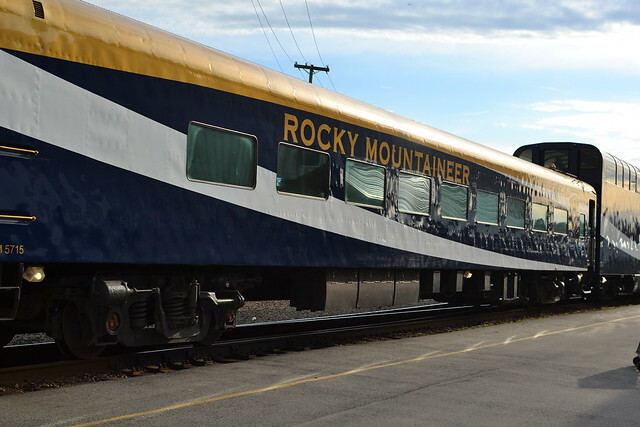 This RMR tour is now marketed as the 'Rainforest to Gold Rush' route. This train runs once per week in each direction during the summer tourist season. This was their last Jasper to Whistler trip of the season for 2013. All photos were taken on September 19th. Lovely. It looks like you enjoyed a good train-chase. 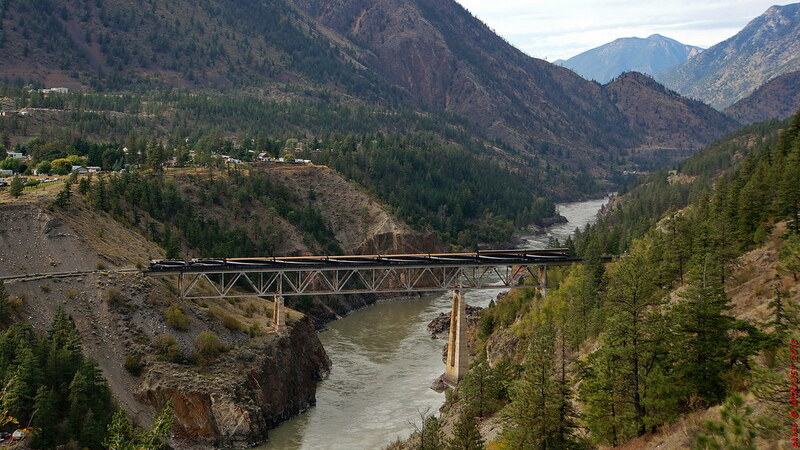 Did the train slow to a crawl as it crossed the bridge at Lillooet? 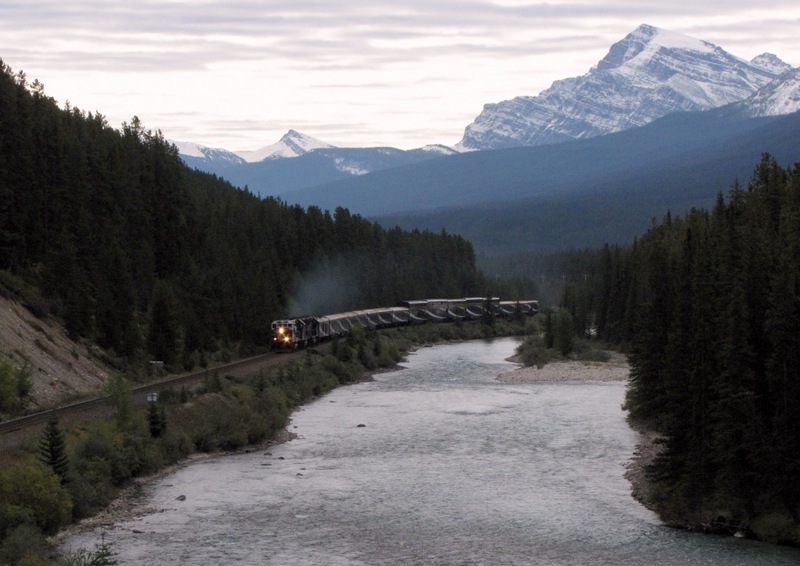 The Calgary-Vancouver route train stopped when crossing the Cisco bridge, so I was wondering if this was the routine for most scenic bridges. I did enjoy a good chase, all the way from Quesnel. Unfortunately I never did manage to find myself in the right place at the right time until the Painted Chasm area just north-east of Clinton, though I did see the tail end of the train as it departed early (~7:30 AM) from Quesnel. The train did slow to a crawl as it crossed that bridge, but I don't think it came to a complete stop. It was not moving very fast as it descended the canyon between Kelly Lake & Lillooet. My RMR train chase included a drive on the gravel backroad over Pavilion Mountain that goes between Kelly Lake and the First Nations community of Pavilion. I would have liked to continue the chase as far as Seton Lake, near the start of the Duffy Lake Road. - have fun watching it and identifying the landmarks. wow that is an awesome video! That would actually be a pretty cool trip to do. I bet it is pretty expensive though! 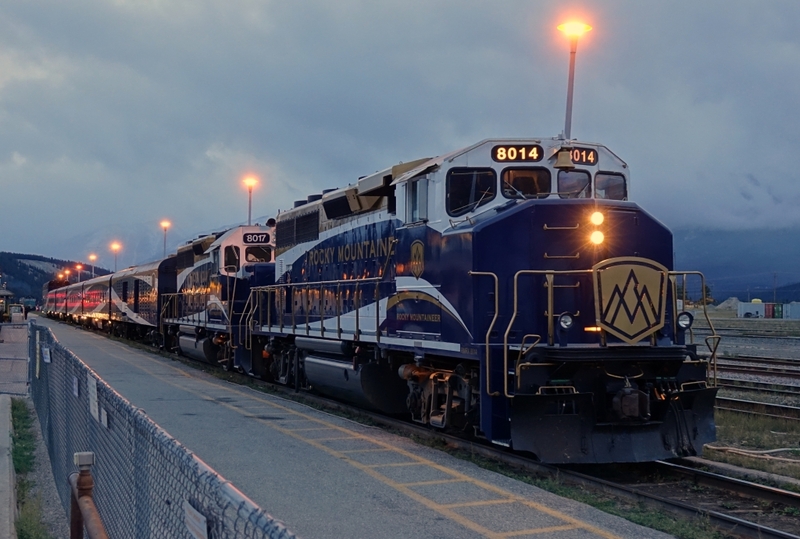 Here are two photos of the Whistler Mountaineer (now marketed by Rocky Mountaineer Railtours as the 'Whistler Sea to Sky Climb'). I took the photos (not the train) on Saturday, June 14th. 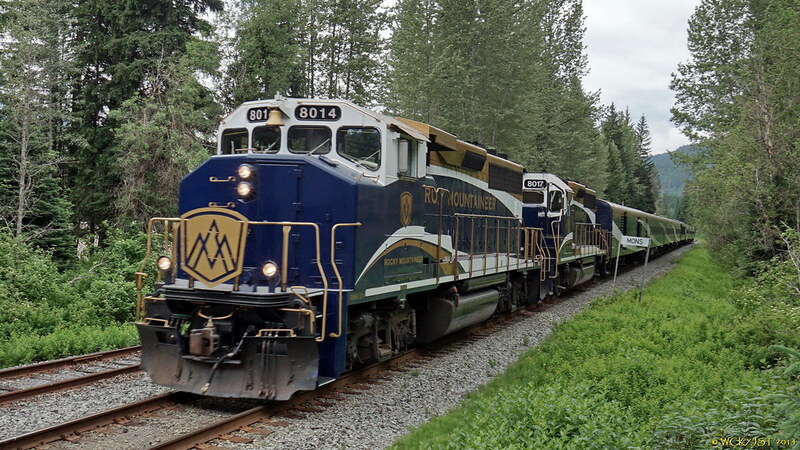 Here are two photos of the Whistler Mountaineer (now marketed by Rocky Mountain Railtours as the 'Whistler Sea to Sky Climb') which I took on Saturday, June 14th. - Did you do a return trip? Is it next day return, or same day return? 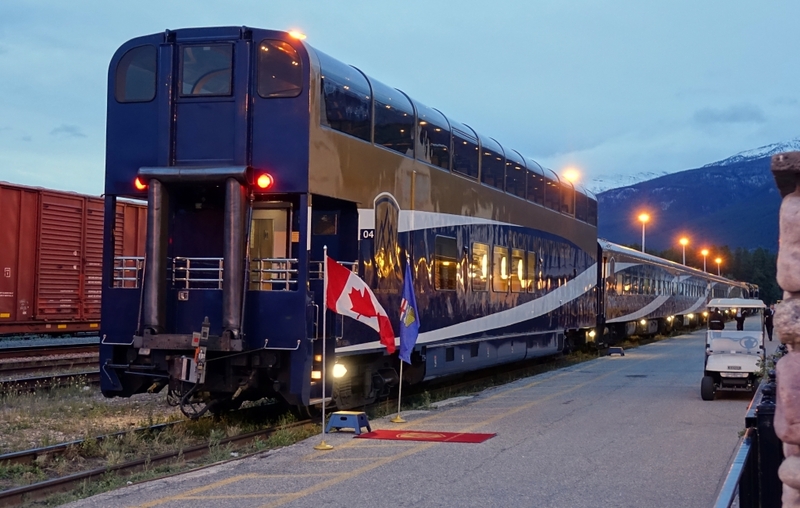 - Do many of the passengers continue on to Prince George and Jasper? - How long is the 1-way ride? - Were there different classes of service onboard? ie. Red and Gold? - Did they slow down on bridges and at viewpoint areas? What were your favourite view moments? - Did you feel pampered? ie. did the quality of service match the price? - How was it for a rail-fan experience? ie the fun experience of riding a train? - Would you do it again, or recommend it to me? Thanks for your time in answering those questions and in sharing any other thoughts and conclusions on your experience. 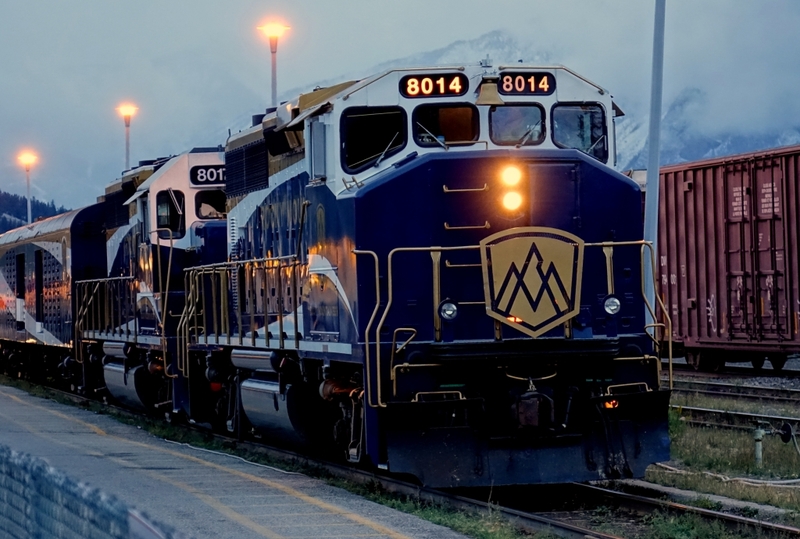 Information on the RM Whistler service is available on their website. 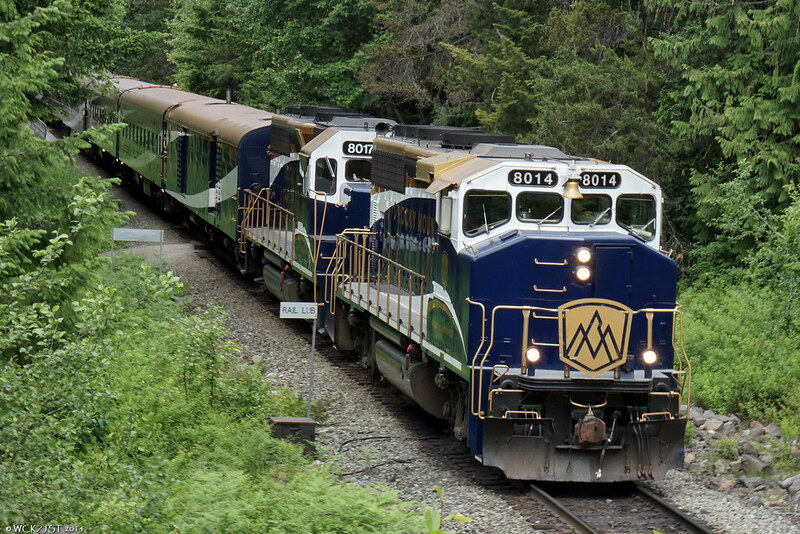 It appears that service is 5 days per week (no Tuesday or Wednesday trains), with the train leaving North Van @ 8 AM and returning from Whistler at 3:30 PM. (Note that this is a summer only service, lasting until about mid September.) There is a 3.5 hour lay over in Whistler during which time you are free to part with more of your money. There appears to be only one class of service dubbed the 'Whistler Class'. You get 'delicious meals' which translates into a light cold breakfast north bound & a light cold supper south bound (if I understand the info on their website correctly). You also get access to 'the Heritage Observation Car' which would be just the thing if you wish to take photos along the way. I worked out a return trip cost for one person at $290 plus taxes, which is a bit pricey but worth it maybe at least once in your life. I compare the cost with what I paid for my WP&YR excursion last summer (Skagway to Carcross, Yukon, with return by bus). IMHO the Yukon trip was better value and arguably more interesting. *After leaving Whistler I stopped at the North Arm Farm just past Pemberton & picked 5 lbs of 'u-pick' organic strawberries to bring home. Then it was on over the Duffy Lake Road to Lillooet & the Cariboo. I over-nighted at Hixon, halfway between Quesnel & Prince George. Thank god for the long days of spring & summer. The next day I completed my journey home with 8 hours of driving & about 4 hours of train watching & visiting a friend in Smithers. haha, I was genuinely thinking that the "which I took" comment in your post referred to taking the train (not taking a picture). Yes, on looking at my wording, I can see that you might have interpreted that to mean that I actually 'took' the train. When you do your planned Horseshoe Bay ferry photo/video shooting day you just might be able to time this for a day when the Whistler Mountaineer will be running. I would estimate that it would be passing Horseshoe Bay northbound at 8 to 8:30 AM, and southbound at 6:30 - 7:30 PM*. Keep in mind that when north bound it will be emerging pretty much without warning from the Horseshoe Bay Tunnel directly above the ferry terminal. With luck though you just might get a TOTALLY AWESOME shot combining train & the C. Renaissance! * My times are quick estimates. You should do some more detailed study to firm up the probable times the train would be passing by. I can confirm this. The train usually passes by when the vessel is approaching berth 1. 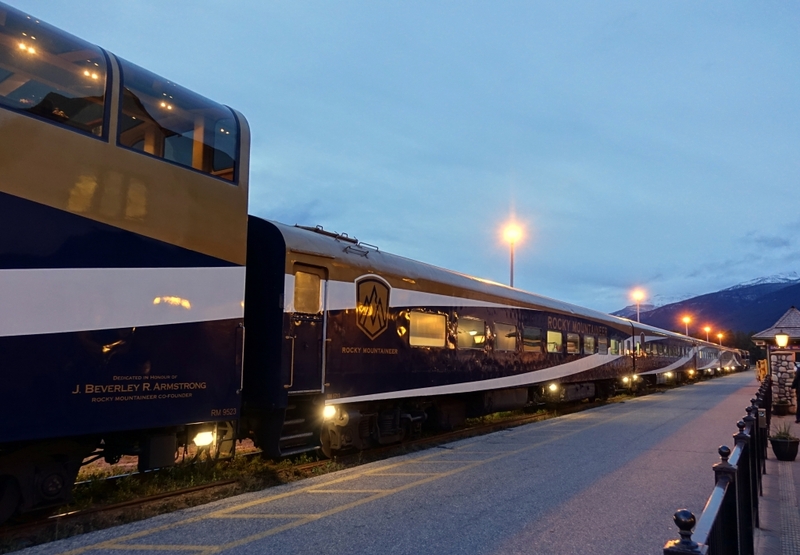 Rocky Mountaineer's "Rainforest to Gold Rush" train (Jasper to Whistler, with a Quesnel overnight) ready for its Jasper departure. - 7:00am on September 10, 2014. Love the photos. Beautiful late summer evening light creates a nice mood. 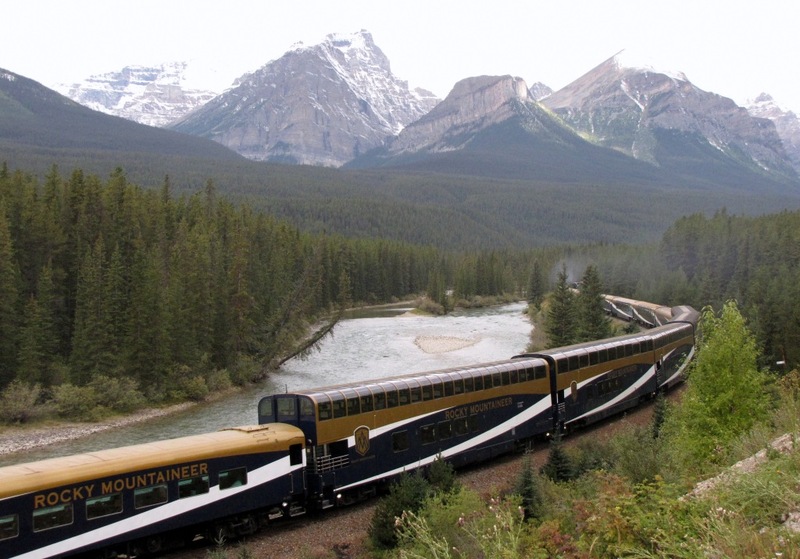 Rocky Mountaineer's Banff - Vancouver train, westbound at Morant's Curve. - morning of September 14, 2014. Same with late summer morning light. 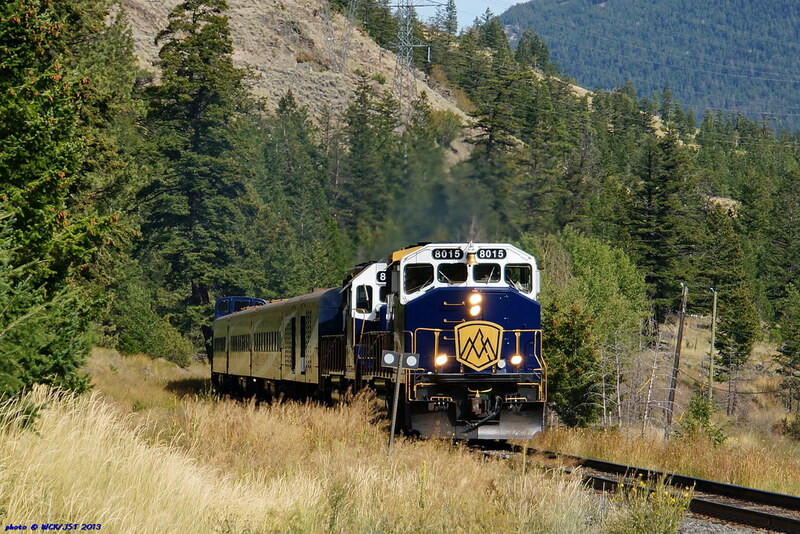 A westward Rocky Mountaineer train headed through Morant's Curve. This was part of 3 hours spent at the curve that morning; loving every minute of it. 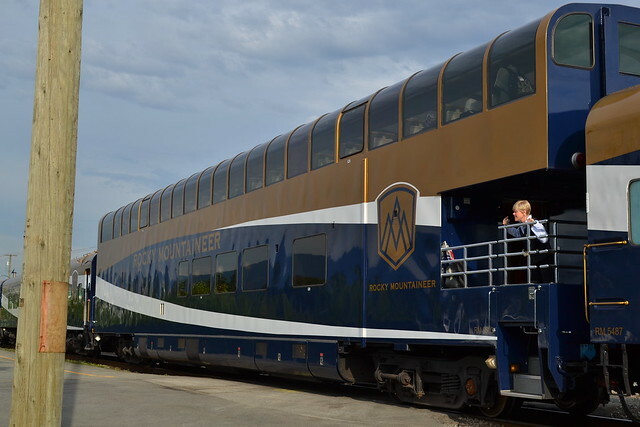 My video of Rocky Mountaineer departing Jasper, on the trip to Quesnel/Whistler. This was September 10, 2014. 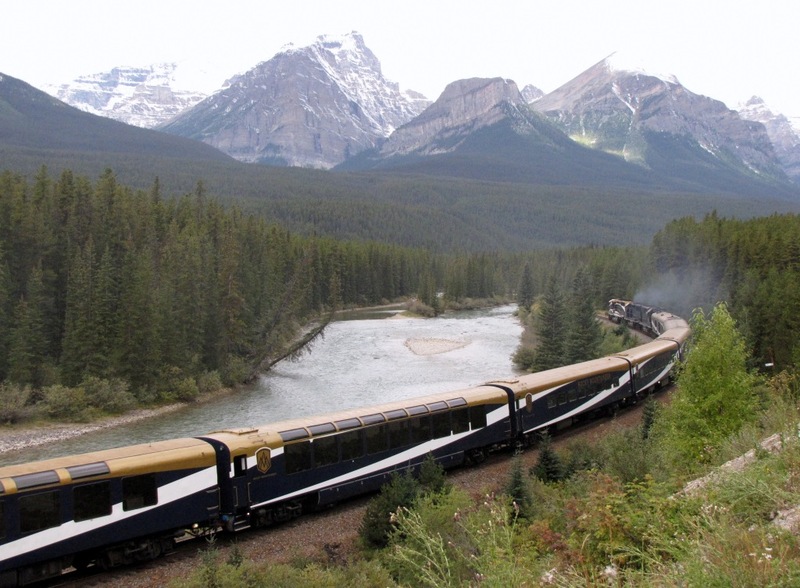 For this less popular route, and it being late in the season, it is a short consist and includes only 1 gold-leaf coach. 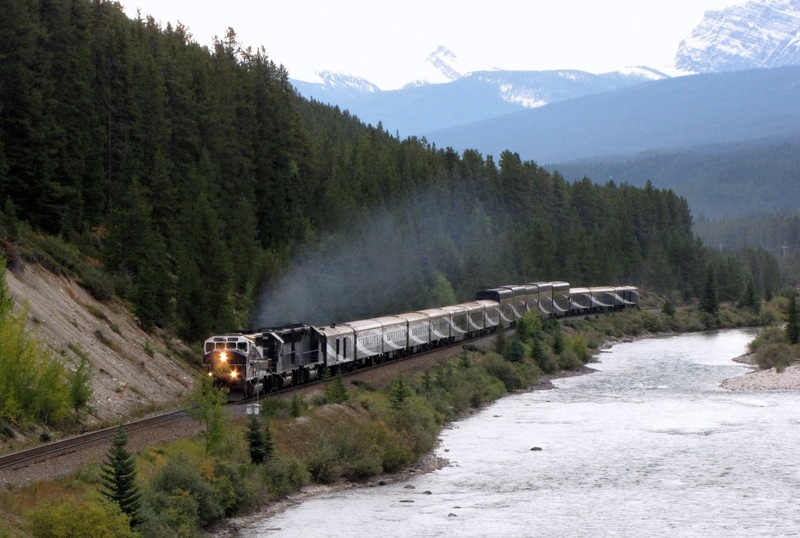 - compare it with the longer consist in my previously posted video, of a Banff-Vancouver train, from same week. In Jasper, preparing to depart for Quesnel/Whistler. - the Gold Leaf coach. Dining on the bottom, observation on the top. 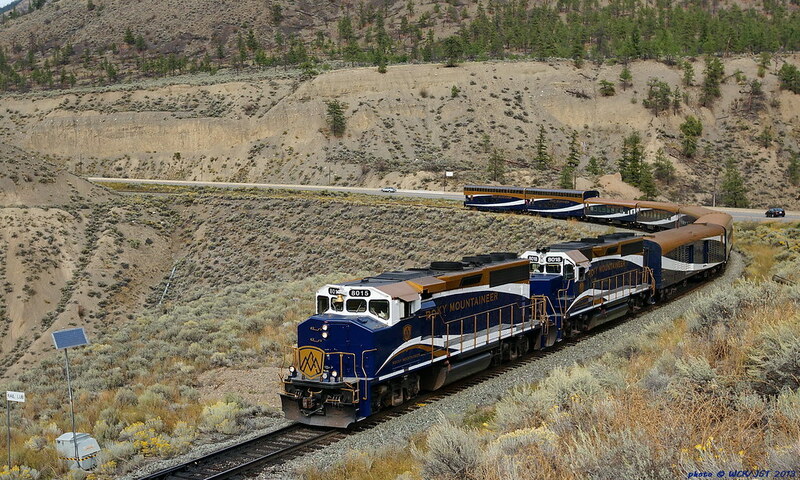 At Morant's Curve, heading from Banff to Kamloops/Vancouver. - notice the 2nd and 3rd locomotives and their simple livery. 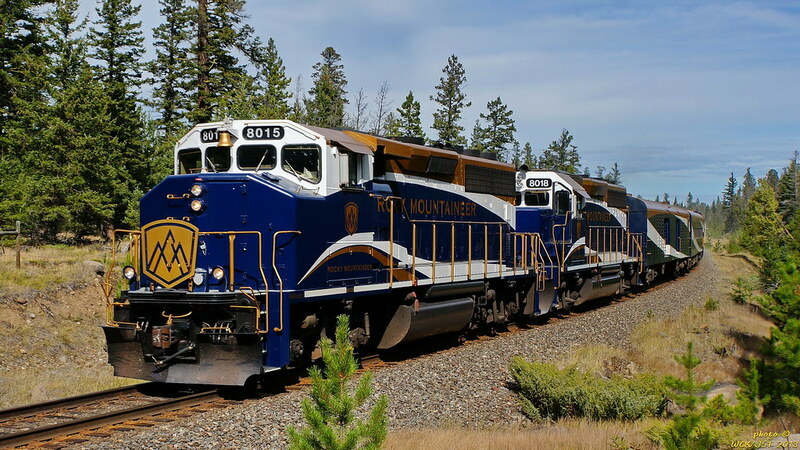 Those plain trailing locomotives are, I understand, leasers, which would explain the lack of RMRT livery. 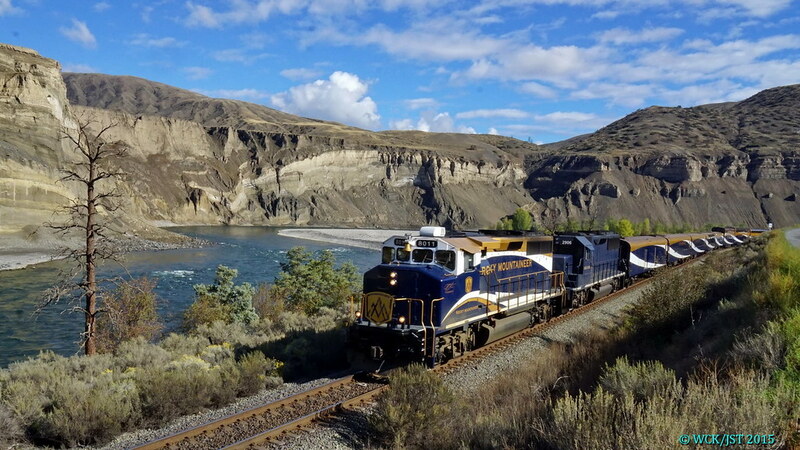 RMRT # 8011 leads west bound excursion train along the Thompson River near Ashcroft on CN's Ashcroft Subdivision - 21 September 2015. 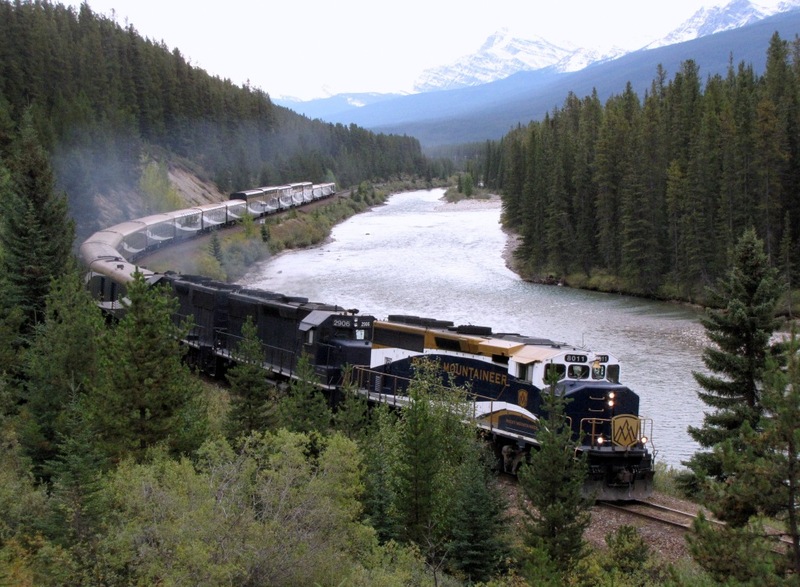 This train was on the second day of a two day trip originating from Jasper, Alberta. 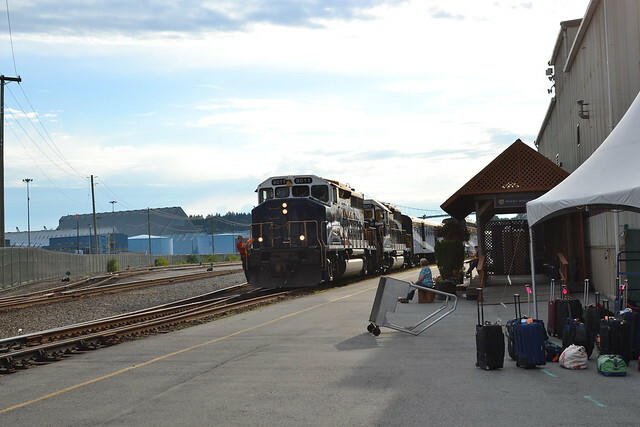 The train, and its passengers, spent the intervening night in Kamloops. The last run ever of the Sea to Sky RMR run happened today. 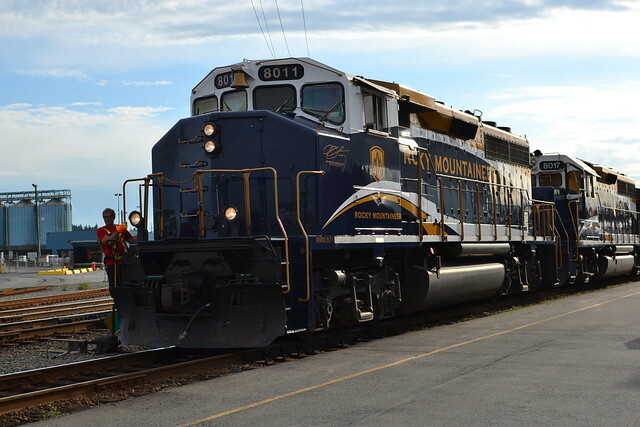 RMR cancelled the run due to low ridership. The Fraser Discovery run will run out of North Van next year. 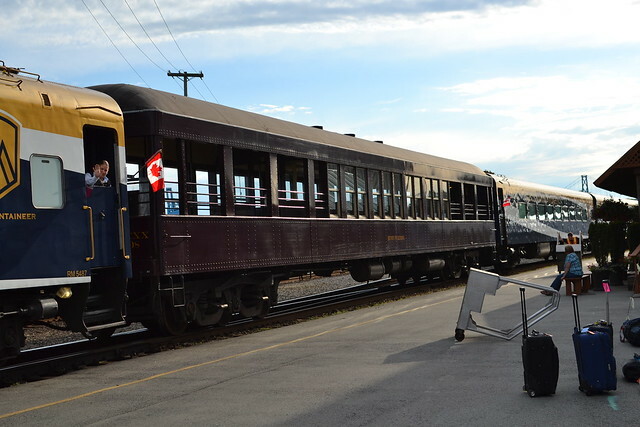 The old way was a separate North Van to Whistler run in the morning, then a change of trains and continuation for some passengers to Quesnel in the afternoon (and for other passengers it was a return to North Van on in the afternoon). Now, the option to just go to Whistler and return to North Van is eliminated. 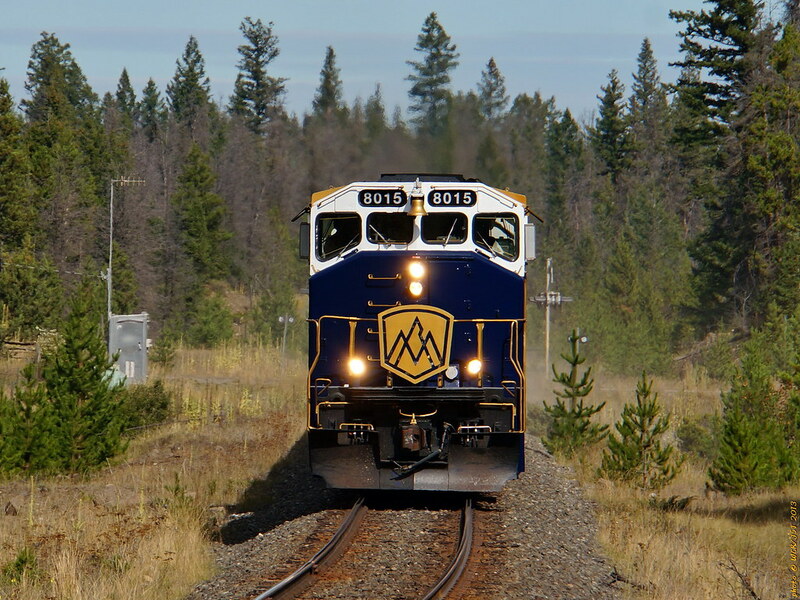 Sounds simpler for the passengers who were doing the Quesnel / Jasper route anyways. Here are some shots RMR when I worked with a coach company who does all the Vancouver hotel transfers and pick ups. 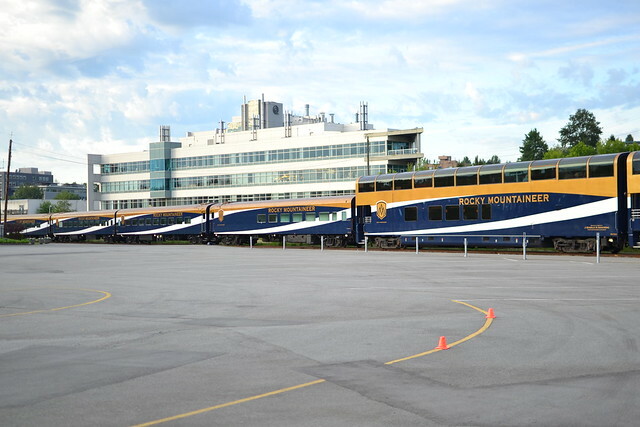 Enjoyed my days working with Rocky Mountaineer GSR's, employees, and passengers included! Who does Rocky Mountaineers transfers in Vancouver? ?